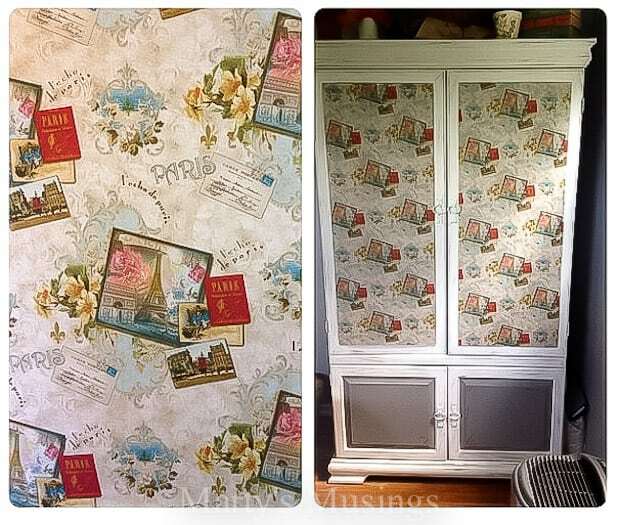 With a little bit of chalk paint, fabric, creativity and hard work this furniture makeover goes from drab to fab! You’ll never believe how great it looks! I would love to say that all our DIY projects turn out exactly as I envisioned. But that doesn’t keep me from trying and experimenting and hoping. 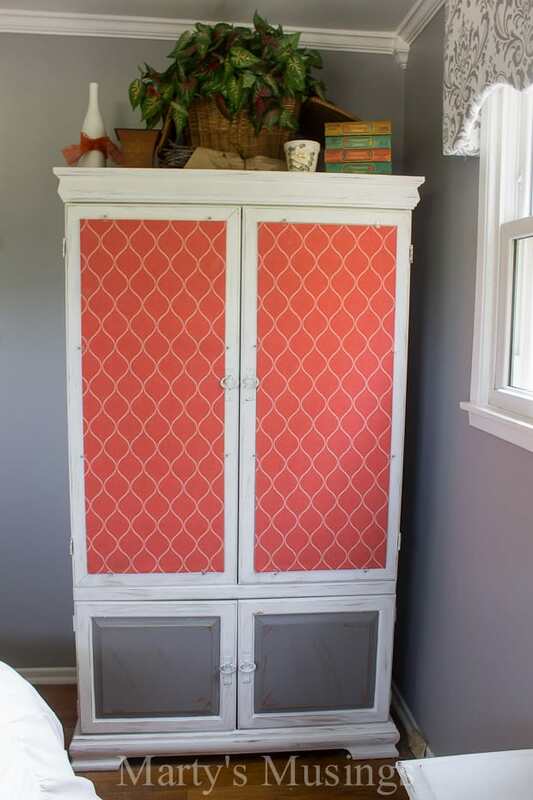 This furniture makeover project was definitely on the experimental side! I thought I knew what I wanted but couldn’t quite get it to work. Luckily my DIY hubby has a lot more patience than he used to, or maybe he’s just resigned himself to my do-overs! 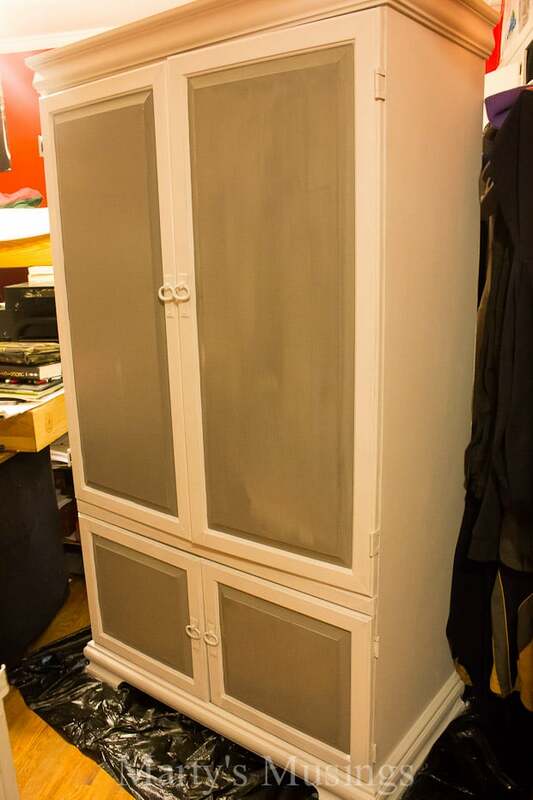 Anyway, we bought this armoire on Craigslist for $75 a few years ago – a lot of money for this thrifty shopper! 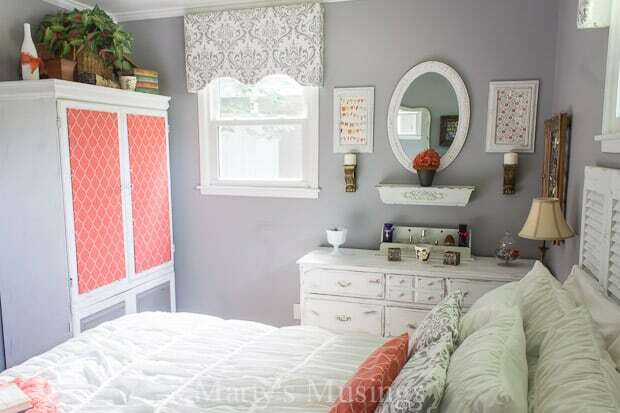 One Saturday we tackled our nondescript bedroom and this furniture makeover was one of our first projects! Let me say first that this is not a high end piece of furniture, so doing anything to it was better than leaving it alone. The default option, at least in this phase of our renovation, was chalk painting. So, it got a couple coats of white and a couple coats of gray on the door faces. However, after awhile the chief decided it just needed a little more pizzazz and we came up with the idea of putting fabric over the upper door faces. Even just this face lift was a big improvement! It always amazes me how a little paint can bring a piece new life. But, like I said, it was just too “matchy-matchy” and we needed a splash of color on such a big unit. Marty: My original idea was a french graphic on the upper inserts. Couldn’t size it right and it was going to take way too much time. Tim: Since the graphic was just not going to come together, I came up with the idea of attaching fabric to 1/8″ tempered masonite, cut to the size of the door faces, and then attached to the doors. If you’re not familiar with tempered masonite, that is the brown pegboard material that all the guys like to hang their tools on in the workshop. You can purchase it without the holes and it is very strong, yet thin enough to use in a variety of applications. I had the masonite cut to size at my local home improvement store, which I do whenever possible. 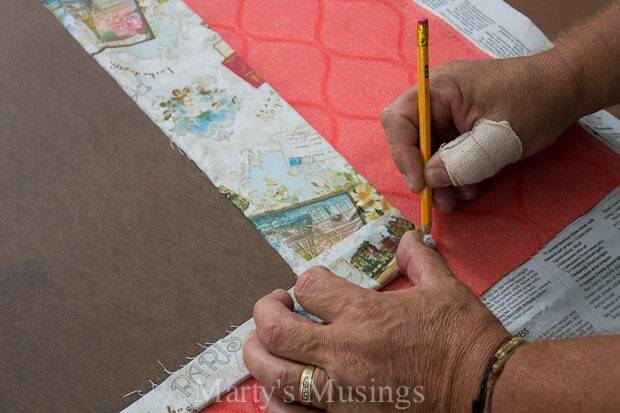 The fabric was cut with a two inch overlap and then glued to the masonite with spray adhesive. More detail on this in just a bit. Next, the masonite was attached to the door, first with very small nails and then, with round two, mirror brackets. Marty: I loved this French inspired fabric I bought, but it just reminded me of my grandma (whom I loved) and was not what I was going for. 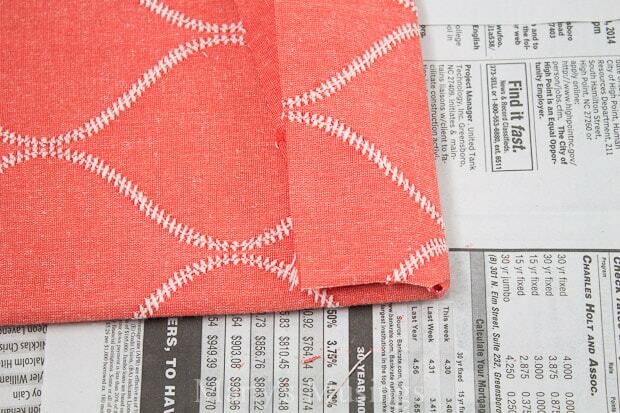 Tim: This is the beginning of round two; changing the fabric to a pop of coral. No need to remove the granny fabric. I just sprayed adhesive again and went right over the top of the mistake. Here, I’m just positioning to ensure proper overlap and consistent pattern placement. Prior to applying the adhesive, the masonite needed to be flipped, so I marked the corners to make sure I got right back in the same spot before the glue set up. “What’s up with the thumb?” you ask? Trigger thumb…a couple cortisone shots and it was as good as new. 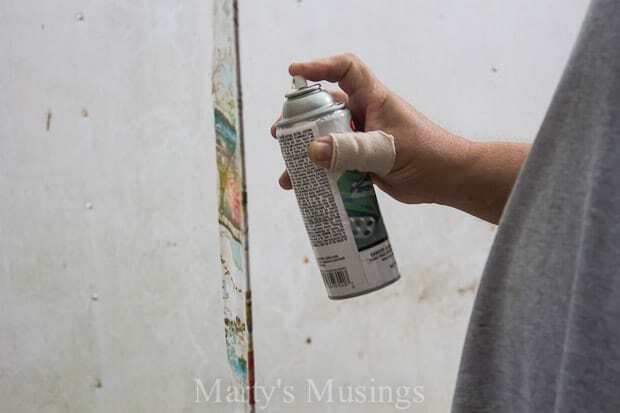 Ahhh…the highly technical art of aerosol spraying! 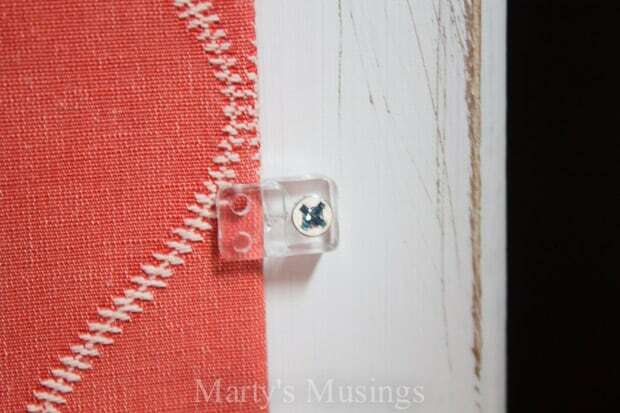 The coral fabric was marked, the masonite was flipped over and sprayed with the adhesive, then flipped back over into place back onto the coral fabric, and the overage was folded over all the way around the masonite. I did spray adhesive all the way around the back side as well, where the overlap would attach, before folding. The only slightly wonky part is the corners and not pulling the fabric too tight as you are attaching. Stretching it too much can skew the pattern and really look terrible. Nice, clean military corners is the key! For round one, I attached the masonite to the door faces with small nails driven through the fabric and masonite into the door. This was not a big issue because the busy pattern hid the nail heads. For round two, I didn’t want all those nail heads to show. 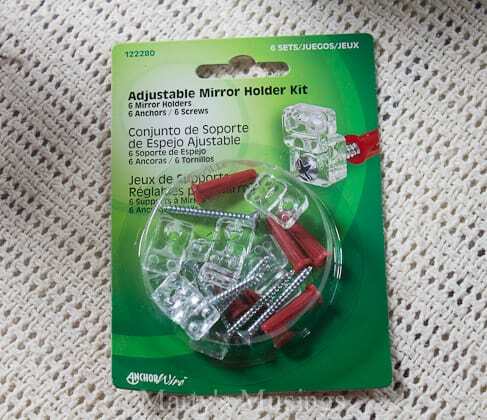 So, instead of trying to disguise how I attached the masonite, I just let it be obvious with these mirror holders. 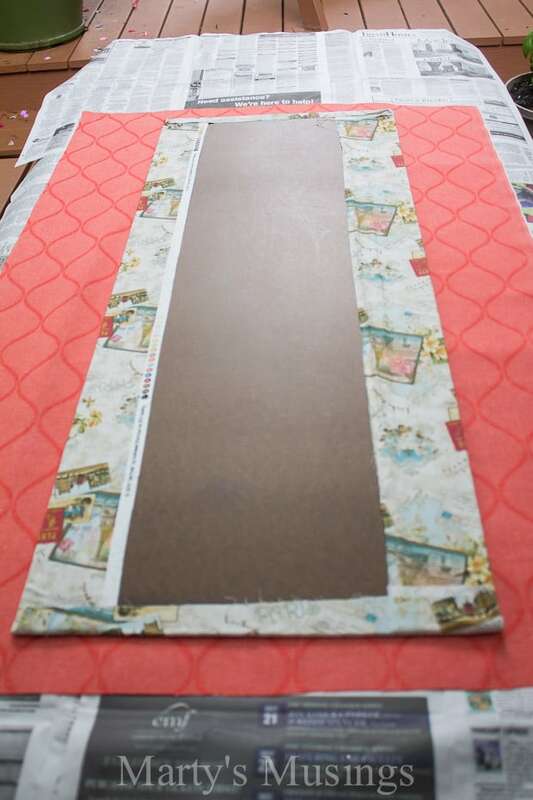 The coral fabric was also much thicker than the granny fabric and glueing to the door face was not an option – I was too far away from the door face for glue to work. Up close, this looks like massive overkill for what I was trying to accomplish, but when it was all said and done, the affect was not appalling at all. It almost adds a bit of character to the piece. The intentionality of equal spacing and placement of the mirror brackets also helps the aesthetics. I also liked the idea that, down the road, we could change this fabric out once again if need be with hardly any damage to the wood. Marty: Home run! 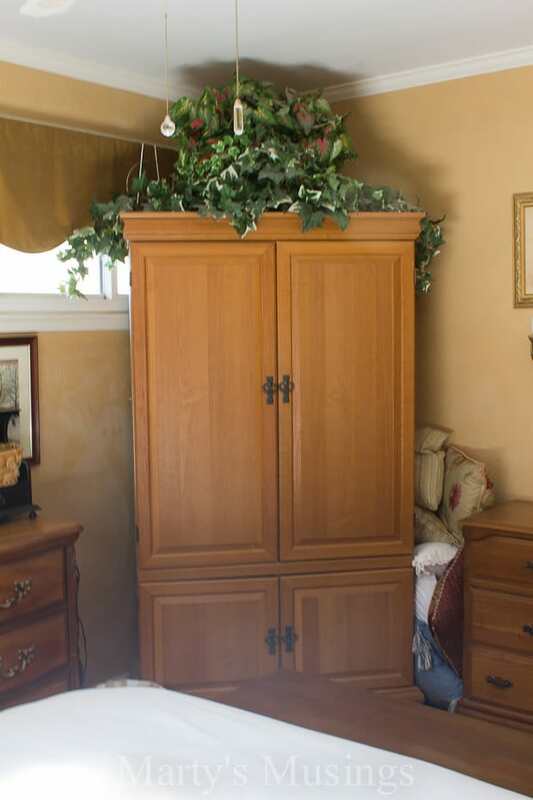 You can see how the armoire is tucked into the corner and gives a pop of color to an otherwise serene room. I couldn’t be happier with my new bedroom that I decorated for practically nothing with no sew fabric cornices. 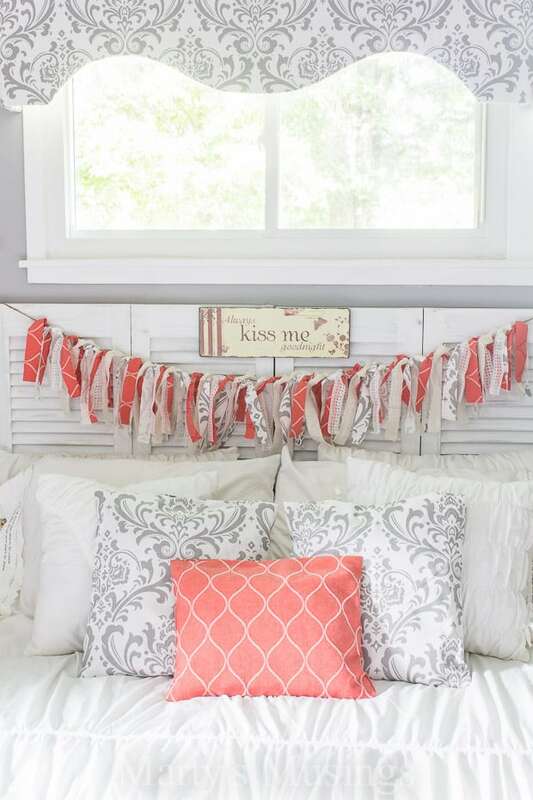 We also made a headboard from an old closet door and I whipped up a fabric rag banner to finish off the bed. What do you think of our furniture makeover? What would you have painted or left this piece the way it was? I love the paint, but can’t find it. Did you order it online or buy it at a local store? 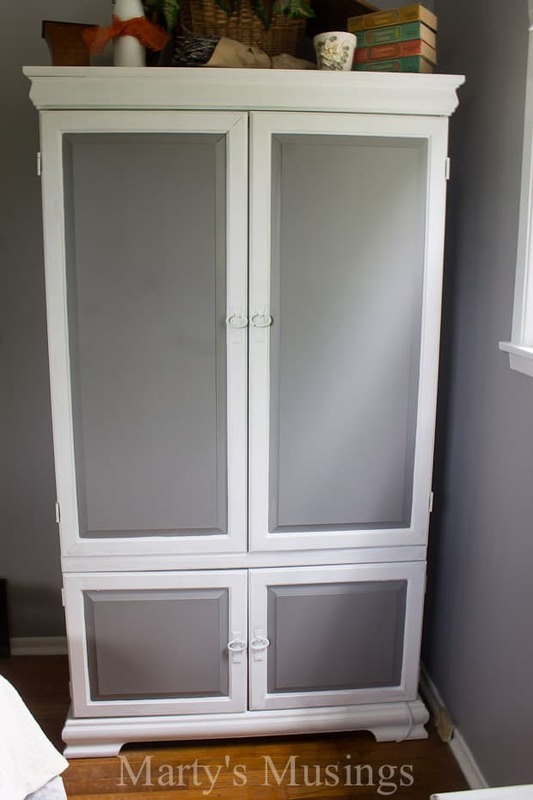 The chalk paint is Annie Pure White (and Clear Wax) and has to be bought from a distributor. The gray paint is from Behr and can be bought at Home Depot. It’s BEHR Premium Plus Ultra, Interior Eggshell Enamel, Pewter Mug 770E-3.